Nevali Çori, not far from Göbekli Tepe (30 km) and Cayönü Tepesi (sort of in between), relates to both these places. What has been found are mostly houses with "plans" like in Cayönü Tepesi plus some kind of structures / temples with some similarity to Göbekli Tepe. Remarkable "art" work has been found plus some other things that make Nevali Çori quite interesting. Maybe there was also a little metal (copper), see below. Unfortunately Nevali Çori has meanwhile been inundated, together with numerous other archaeological sites in the vicinity, when the Atatürk dam raised the waters of the Euphrates. The oldest layer goes back to the 10th millennium BC, the layer just above that dates to 8600 BC - 8000 BC according to a C14 analysis. It is thus a little younger than Göbekli Tepe but overlaps to a considerable extent. At present it carries some fame because the people there seem to have be the first ones who cultivated wheat, about 500 years after the Göbekli monuments were built and quite some time before the sendentary life style, raising crops and engaging in animal husbandry, became common. The "houses" found are similar to those in Cayönü Tepesi. 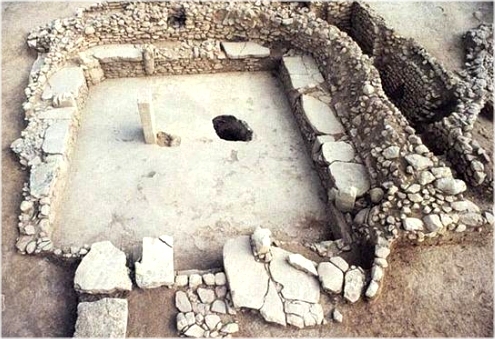 Buildings akin to the "grill", "cell", and "channeled" type of Cayönü Tepesi were found, but also, most remarkably, ceremonial rooms or "temples" with a terrazzo floor (in the later phase), not unlike the "temples" of Göbekli Tepe. 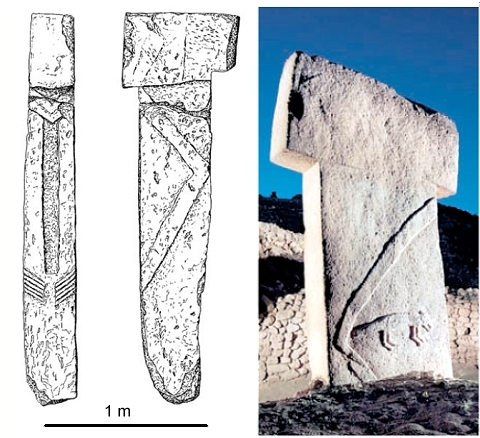 Source: Klaus Schmidt "Göbekli Tepe  the Stone Age Sanctuaries. New results of ongoing excavations with a special focus on sculptures and high reliefs" Documenta Praehistorica XXXVII (2010) p.239 - 256. Used with friendly permission. Surprise! Homer Simpson is a Turk! 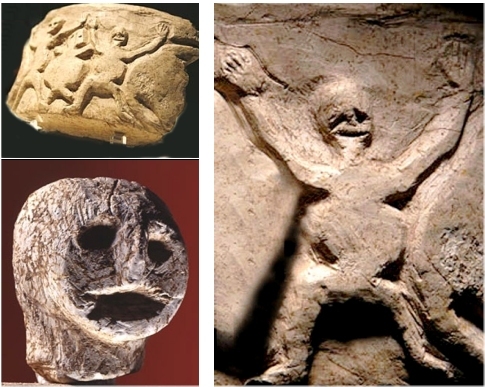 The carving in a limestone bowl (upper left) actually shows two humans and a turtle in a dance. The turtle either symbolizes death or is a fertility symbol. Maybe it is just an empty shell used as a drum, or - my favorite - it reflects an altered state of consciousness of the dancers 1) (after imbibing beer or wine or eating some good mushrooms; I guess). Take your pick. People in Nevali Çori buried their dead on occasion under the floors of their ceremonial buildings - possibly body and head separately, like in Cayönü Tepesi. There are many obvious similarities to all those other stone age towns but also definite differences. But we simply do not know enough about neolithic man and woman, except that the were pretty weird. Sort of like Californians, I guess. So did they have copper? It is sometimes suggested. However, Ünsal Yalcin and Ernst Pernicka, eminent archeometallurgists write (my translation): "It is remarkable that a large number (113) metal objects were found in Çayönü Tepesi because in contemporary settlements in East Anatolia hardly any were found. Only a so-called butterfly bead came from Nevali Çori, thought to be contemporary to the later pre-pottery strata of Çayönü Tepesi. This is, however, not supported by a metallurgical analysis" 2) (that suggest a much later date). I'll take that as a hint that there was no copper in Nevali Çori. 1) P.E. McGovern (the leading authority on ancient alcoholic beverages): "Uncorking the past." the quest for wine, beer, and other alcoholic beverages". 2009 Berkeley (CA) & London: University of California Press.